The support program is being executed between January 2017 and July 2018 in order to improve the sustainability standards of the SME segment of the pork industry. 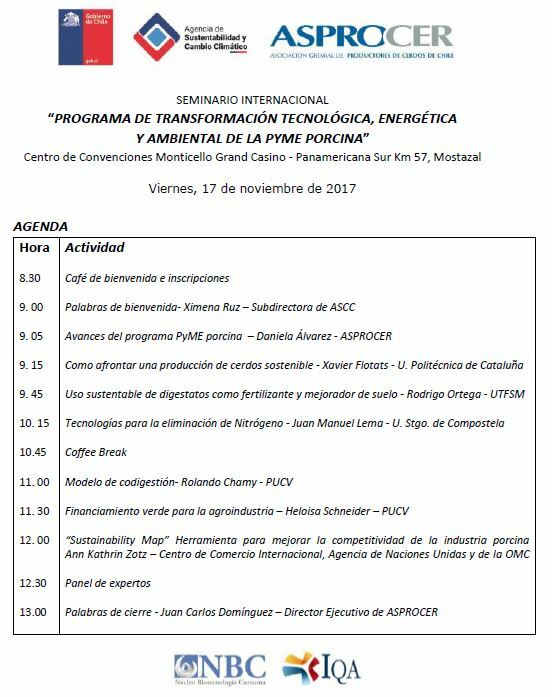 To that end, the State is investing nearly 400 million pesos through ASCC to develop investment projects to implement technological, energy and environmental improvements for the sector. “Thanks to the public and private effort made over the past few decades, the Chilean pork sector has positioned itself as a key player in exports, placing sixth in the world. Today we face enormous potential demand and we must make our way back to the path to growth, making progress on such key issues as territorial organization, a regulation for nuisance odors and new technology and management standards that will allow us to move towards a circular economy. 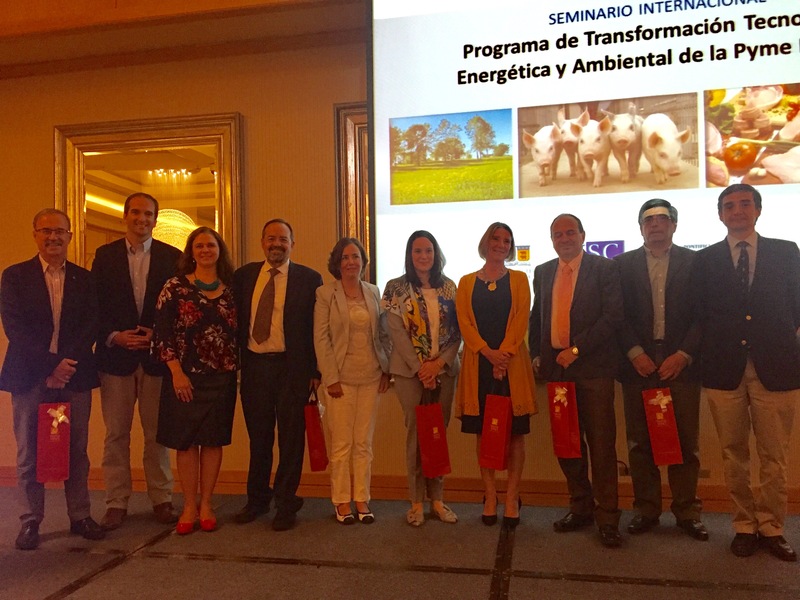 This project is important for our SMEs and we are grateful to the Agency for Sustainability and Climate Change for all of the support that it has given us,” stated Juan Carlos Domínguez, Executive Director of the Chilean Pork Producers’ Association (ASPROCER). “The sector’s large-scale producers have made progress on impact mitigation technologies because they have the ability to access them. However, it is the small and medium-sized businesses that need to improve their clean technologies and processes in order to ensure their long-term sustainability and competitiveness. Through this program and other initiatives that the Agency is supporting, such as the Danish government’s P4G project, Partnering for Green Growth and the 2030 Global Goals, we are transferring knowledge to the companies so that they make good decisions in addition to providing support for their search for funding,” stated Ximena Ruz, Acting Director of the Agency for Sustainability and Climate Change (ASCC). The seminar featured experts from various organizations, including Dr. Juan Lema of Universidad de Santiago de Compostela, Dr. Xavier Flotats of Universidad Politécnica de Cataluña, Ann-Katherine Zotz of the International Trade Center (ITC) – which forms part of the WTO and United Nations -, Dr. Rolando Chamy of Pontificia Universidad Católica de Valparaíso (PUCV) and Dr. Rodrigo Ortega of Universidad Técnica Federico Santa María. The latter two speakers are also the co-coordinators of the aforementioned program. The 100-plus attendees included representatives of trade associations, pork producers, academics from Chilean universities and representatives of public services involved in this area. In 2016, the Chilean pork industry produced 584,000 tons cwe of pork. It exported 55% of the pork produced, ranking sixth in the world for pork exports. The Chilean Customs Service reports that the country currently exports pork to over 30 markets and has clearance to export to a total of 60. The main markets are Korea, Japan and China, which together import 67% of the shipments.